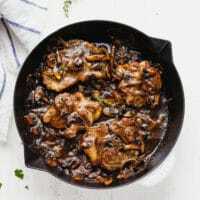 Baked Pork Steak Recipe - tender and juicy pork shoulder steaks, lightly browned on the stove top and then cooked in the oven together with mushrooms and onions for a quick and effortless meal. Season with salt, pepper, paprika and garlic powder (optional). Heat olive oil in a skillet over medium heat. Add pork steak and cook for 2 minutes per side until no longer pink. Transfer to a plate. Add mushrooms and onions and cook for 2 minutes. Add pork chops back to the pan. Add wine (water or stock could be substituted). Add more salt, pepper and thyme. Cover with foil. Add the pan to the oven and bake for 20-25 minutes, covered.